An all in one travel solution is the ultimate choice for new parents looking to get the most out of convenience with having a baby. These travel system strollers help simply life and have become a fan favorite among new moms looking to make life more convenient. 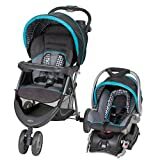 These strollers allow you to move a baby sleeping from the stroller to the car and is made up of a stroller, car seat, car seat base.The tremendous value of travel system strollers will save you a ton of money in the long-run as it cuts out the cost of having to buy 3 or 4 separate products. In many instances, they’re cheaper if not as cheap as one product and most models extendable as your child grows with infant, booster and child seat functionality. Our next review details the Top 5 Travel System Strollers in 2018 while looking at overall value, price, performance, ease of use, durability and safety. Britax may not be the biggest name in the nursery, but after introducing this travel system stroller they should be. This stroller is second to none when it comes to safety which far exceeds the federal safety standards that are recommended. Going above and beyond bodes well for parents and offers amazing value which will save you a ton of money. Scoring a perfect 10 and boasting all-perfect consumer reviews on Amazon, it’s easy to see why it’s so highly regarded. Offering convenience, safety and portability in one highlighted by a Safe Cell Impact Protection System which is leading the industry. Other features include side impact protection, simple closing operation, lightweight aluminum frame, and is fully compatible with other Click and Go Strollers allowing you to extend its use. The Graco Aire3 Gotham claims the 2nd spot in this review and is yet another near-perfect travel system stroller. This model is a 3-wheel stroller with a simple folding operation which takes one second and only one hand. For ease of use and portability there is no better option and even locks in a self-standing position making it easier to store. The Aire3 Gotham includes the highly-acclaimed Graco SnugRide Click Connect 35 Infant Car Seat. This rear-facing car seat accommodates infants to 35-pounds and offers plenty of safety features which have become standard with Graco. Notable features include a reclining, multi-functional seat and a lightweight, but durable design coming in at only 22 pounds. Build on a reputation of assuring infant and baby safety, Safety 1st needs no introduction. 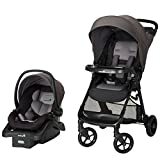 This travel system stroller and car seat combo is one of the best values in this review coming in much less then similar, competitor models. Highlighted by an infant car seat that accommodates infants from 4 – 35 pounds with great impact protection assures what parents care about the most. The Safety 1st Monument 2 travel system stroller offers the perfect fit for newborns of all sizes from small to extra tall. Complete with 4 harness heights offering the perfect spacing while offering a secure fit for all newborns. Designed to be lightweight and convenient to carry, the Monument 2 easily attaches the car seat to the stroller with one click. The EZ ride 5 from Baby Trend is another great model for those looking for a more convenient stroller and infant car seat combo. This model accommodates newborns from 4 – 30 pounds and to a height of 30 inches or less and comes in aggressively priced. Perfect for parents on a budget while giving you all the convenience you need along with a handlebar that’s adjustable and multi-function reclining seat. The EZ Ride 5 Hounds Tooth scores a 9.4 out of 10 extends its use beyond infants as it’s fully compatible with child car seats. Fit from birth to 50-pounds, the extended use will save you hundreds of dollars in the first couple of years of your newborn’s life. Notable features include one-handed folding, storage basket and padded head support for added protection. 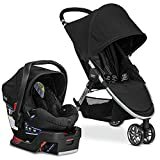 Rounding out this review is the Trend Expendition which has become one of the best-selling travel system stroller and car seat combos of all-time. Baby Trend did it right when they introduced this model with nearly 600 consumers agreeing with us on Amazon. When it comes to ease of use, performance and safety this is it, and at this price no one’s complaining. The Expedition Phantom Jogger is the perfect option accommodates newborns to children of 50-pounds. The extended use makes it enough to consider which includes a padded seat that reclines along with a 5-point harness. It also offers amazing side impact protection with a EPS energy absorbing foam along with a simple latch which makes it faster and easier to use. When it comes to convenience, there is probably no singular product that offers more for parents than a travel system stroller. These all in one solutions make it possible to move your baby from car to stroller and vice versa without interrupting your little one. The extended use adds in more functionality accommodating most children to 50 pounds giving you more bang for your buck. 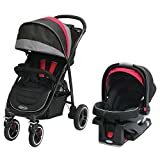 If you have anything to add or any experience with any other travel system stroller not in this review, why not share your experiences with the rest of the community in the comment section below.